The hotel is located very close to Bamboo beach. Almost all rooms offer a view towards the see, especially the apartment. The swimming pool is nice with proper cold water for the hot summer days. The staff were young and very kind. Excellent sea view from the garden. The breakfast was delicious, the room was clean. Cozy and quiet place. Really cute hotel! It's a newer construction and the room had a cute design. They have parking included which is a big plus in Sozopol cause my sister's car got towed while we stayed at another place because parking is a scarce. The breakfast was good. The dining area overlooks the pretty pool and has a water view which is always nice. Our room had a view also even though the terrace was technically facing the other building. The front desk girl was very polite and accommodated us with a roll in bed for a small fee of course. Terrible terrible place. No cleaning for 5 days, restaurant not working, dirty rooms, disgusting smell, wet towels, no parking. We left two days earlier, they promised to reimburse the cost for 2 nights but never did. There are tons of hotels in Sozopol, never never go to this one. Pool area is great. Location is great. Very close to Bamboo beach and great sea view from the pool. Budzhaka area is very nice - close to the center and in the same time very quiet. Bed is very comfortable. View and garden. It's just what it should be at this part of town - wonderful! Well kept garden, many blooming roses, nice garden furniture. Lovely hotel in a good area. Next to beach and a short walk away from shops. Clean rooms and staff were helpful when needed. We really like the place. It was quiet. Both beaches are by 5 minutes walk. Everything was clean and the staff were really friendly. Also the view from our room was amazing! Quiet location, close to the sea, nice view, decent breakfast, quite clean. You can also eat in their restaurant and the food is quite good at reasonable prices, though not very variate. The sea side is also very nice. Relax Hotel This rating is a reflection of how the property compares to the industry standard when it comes to price, facilities and services available. It's based on a self-evaluation by the property. Use this rating to help choose your stay! One of our top picks in Sozopol.Relax Hotel is located directly at the sandy beach in the Budjaka area of Sozopol and offers an outdoor pool. Free WiFi is available in some rooms. All air-conditioned rooms open to partial sea views and have a flat-screen TV. The rooms are reachable by elevator and daily maid service is provided. The hotel has a restaurant with a terrace opening to sea views that is opened from 19:00 until 22:00 o'clock. On site there is also a bar, serving sandwiches and drinks until 18:00 o'clock. In addition, a buffet breakfast is available at the property. The center of Sozopol is reachable within a leisurely 20-minute walk. 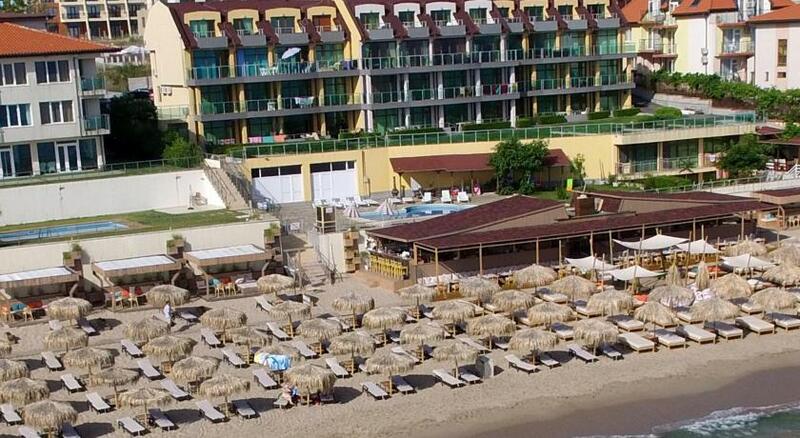 Harmanite Beach and the lively center of Sozopol with bars, shops and restaurants are 0.6 mi away. Nearby the hotel there is also a beach bar and shops. Smokinia and Gradina camping areas, and their summer beach bars, are 1.2 mi away. Burgas Airport is 28 mi away from Hotel Relax. When would you like to stay at Relax Hotel? This en-suite unit offers a balcony with panoramic views of the sea, wooden furniture with carving, a sofa, a mini-bar, air conditioning, a flat-screen TV and a private bathroom with a shower, a hairdryer and free toiletries. Fitted with wooden furniture with carving, a wrought iron bed, air conditioning, a mini-bar, a flat-screen TV and a bathroom with a shower, a hairdryer and free toiletries. Spacious room with attached bathroom with wooden furniture with carving, a sofa, a table, a mini-bar, air conditioning, a flat-screen cable TV and a larger furnished balcony with partial sea views. The private bathroom features a shower, a hairdryer and free toiletries. This room features wooden furniture, air conditioning, a mini-bar, a flat-screen TV and a sofa. The private bathroom comes with a shower, a hairdryer and free toiletries. The balcony offers partial sea view. This suite has air conditioning, cable TV and sea view. House Rules Relax Hotel takes special requests – add in the next step! Relax Hotel accepts these cards and reserves the right to temporarily hold an amount prior to arrival. Please inform Relax Hotel of your expected arrival time in advance. You can use the Special Requests box when booking, or contact the property directly using the contact details in your confirmation. No elevator to the restaurant. With baby stroller you have to use the long stairs or go outside between parked cars around the hotel and same stairs near the pool to reach the restaurant. Very small parking. It is possible to be blocked by other car and wait... I think there was no food in the restaurant except breakfast and may be french fries. Breakfast could've had more variety, such as croissants and pastries. the breakfast is usually the same and you don't have many chooses, so If you stay more than 4-5 days it makes you think going somewhere else to eat. The city is not offering you much, other than walking in the rather small old town you don't have much to see. Also the most restaurants I tried were quite bad and very expansive. Some did even tried to charge us more than we ordered. The prices for sun beds and umbrellas were high also starting from 27 leva for 2 persons. Breakfast not brilliant and the two staff responsible for the bar/breakfast/pool area were very arrogant and not friendly at all. Location, just next to the beach and the pool area very nice. As mentioned, the property has great potential (location, nice rooms and public areas, garden with pool and amazing view), but it felt abandoned...service ways. Having some more staff around, to clean, and keep the tidiness, polish the windows and keep them always shiny and clean (from the restaurant looking to the pool - since the view it's one of the main advantages of the location) and tables around the pool, having the garden and pool areal always organized and welcoming for the guests, watering the beautiful roses to keep them green all the time, would make an amazing difference! Let me say it this way, the property it self is amazing and I loved it, service and guest relation ways needs improvemnt and that will make it the best choice - a relatively small investment in staff and staff training (housekeeping, breakfast host and waiters, receptionists) would completely make the property one of the favorites in Sozopol. Honestly, the property has great potential! We had several rooms and they were cozy with beautiful partial view. The garden with the pool are lovely as well. The parking lot is rather tiny and could fit only a certain number of cars. The beds are quite too soft for my taste. I'd also recommend higher pillows. Terrible breakfast!!! Not much diversity, low quality minced sausages, tasteless melon, worms in plums! Descrition and many guests fancied those breakfasts and it was a dealbraker for us. How disapointing.... Rooms with french balcony means no balcony at all, only tall windows (from floor level up). Breakfast can be more variate; we asked the guys to refill the food since it was terminated and they didn't give attention to do this proactively; It will be good to have more information on the reception about the public transportation that can be used to reach the old town or some support, like cab costs, etc. The area around the hotel is quite crowded, the street is very narrow. The staff was very nice, friendly and helpful; breakfast was OK but could be better. Uncomfortable bed. Parking area only if you are lucky. Mold in the room and bathroom. Not clean semi visible places. The ice cream from the previous tourists still in the fridge.